Ittai Shapira was born in Rochester, NY, when his father was on sabbatical but grew up in Israel. He did not begin playing the violin until he was nine years old, unlike many child prodigies who begin as early as age three. He had asked to play violin at age five, after watching a friend play, but his parents resisted, wanting him to play piano. He refused. A few years later, still interested in their son’s playing piano, his parents negotiated with him: “Take one violin lesson and one piano lesson, and then decide.” Violin won out. He had followed in the footsteps of her earlier pupils and after her death had come to New York to study at Juilliard and build his career on the world stage. Many of her pupils have become soloists, first violinists, chamber music players, and members of string quartets. Some of the stars included Pinchas Zukerman who said of her “she didn’t ruin talent as so many teachers do” and for him, she was a “second mother”; Shmuel Ashkenasi, her very first pupil; and Shlomo Mintz. She also had young violinists routinely interact with older established musicians, enriching the experience for all. One of Shapira’s earlier compositions was an homage to Feher — “Magyar,” a Concerto for two violins — which was inspired by her Hungarian roots. (See two brief clips below: “The Potion” and “Gypsy Raves.”) He and his fellow colleague, Haggai Shaham, have created a foundation in her name to nurture and promote young Israeli violinists. At Juilliard Shapira studied with Dorothy DeLay and Robert Mann. It was Mann who introduced Shapira to modern music, a departure from the classical repertoire he had been studying up till that time. And it was DeLay who combined a form of meditation in the exercises she assigned. Both teachers challenged the young Shapira in other ways. DeLay was routinely five or six hours late for Shapira’s lesson, and often he’d be playing a new piece for her at 1 AM. And Robert Mann, the founder of the first Juilliard Quartet, was warm and charming as well as demanding, inspiring, and thought-provoking. All this prepared him, says Shapira, for the idiosyncratic ways of conductors, with whom you need to get along so as to be invited to play with their orchestras. 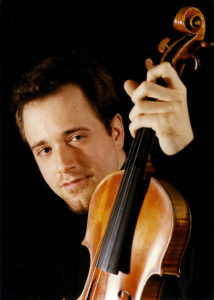 Shapira began performing regularly as a soloist in his late teens and made his “critically acclaimed Carnegie Hall debut in 2003, performing the World Premiere of the Violin Concerto written for him by compatriot Shulamit Ran.” In subsequent years he has collaborated with many other musicians and composers, and to date 15 concertos have been dedicated to him. He also commissions new work. “I tend to work with composers who are quite familiar with my playing and are open to a collaborative process with lots of give and take and rewriting.” He has premiered at least one new piece a year. In recent years he has been involved in a wide range of projects that include performing Dave Heath’s composition in memory of Daniel Pearl on the soundtrack of the documentary, The Journalist and the Jihadi, and touring a concert piece written for him by Glen Roven, The Runaway Bunny, which he performed with Glenn Close and recorded with Brooke Shields. Shapira serves as classical advisor at Molloy College and the Weill Cornell Music and Medicine Program and has given concert lectures about music and the brain at Cambridge University (UK), Mt. Sinai Hospital (NY), and New York University.